Wreck Diving Magazine – Issue 38 | Dive Industry Association, Inc.
Issue 38 of Wreck Diving Magazine has shipped to our distribution warehouses and will be shipping to subscribers, retail stores, and dive shops very soon. 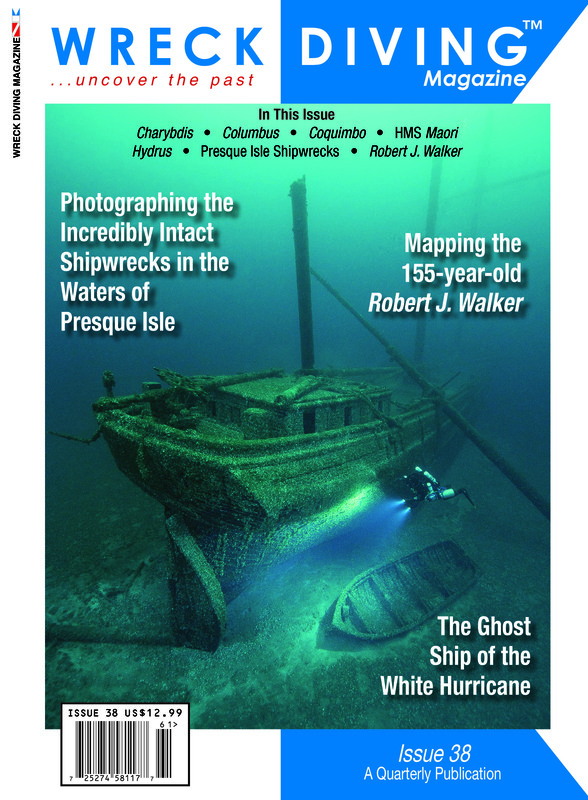 You can subscribe or renew at www.WreckDivingMag.com, or by calling Heidi at 864-244-9861, or toll free at 855-WRK-DIVE. Shipwreck Photography: Becky Kagan Schott photographs some incredibly intact shipwrecks in the waters of Presque Isle- If only they could talk. Charybdis Catastrophe: The beginning of the tunnel. Workhorse in the Wilderness: The historic tugboat, Columbus, lies in the harbor of a remote Lake Superior ghost town. Mapping the Robert J. Walker: A team of experts identifies and maps a 155-year-old government steamer. The Ghost Ship of the White Hurricane: A casualty of the Great Storm of 1913, the Hydrus. A German Mine Sinks a Three-Masted Square Rigged Schooner Off The French Island of Ré: The Tragedy of the Coquimbo. Meeting a Famous Tribal-Class Destroyer in Malta: HMS Maori.